East view of the mill at Landwade on border between Cambridgeshire and Suffolk. 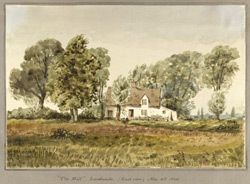 In the manor of Landwade, since medieval times there were two watermills. In the 17th century a new watermill was built. It had a single storey with dormers (a window placed vertically on a sloping roof) and a central chimney. It was demolished some time between 1849 and 1884, and its is not known now where it stood in the estate. Buckler's watercolours in the British Library Manuscripts collection (Shelfmark: Add. MS. 36979 f.37) suggest it stood to the east of the stone barn and near the south western corner of the medieval moat.